“True metal” megastars MANOWAR are currently on their Final Battle world tour, which is going to be their last ever world tour, and they reached Denmark last Monday in Valby Hallen. Now, this is the first time I’ve seen Manowar so I don’t have the perspective of a long-time fan, but I have to say that I was a bit let down. 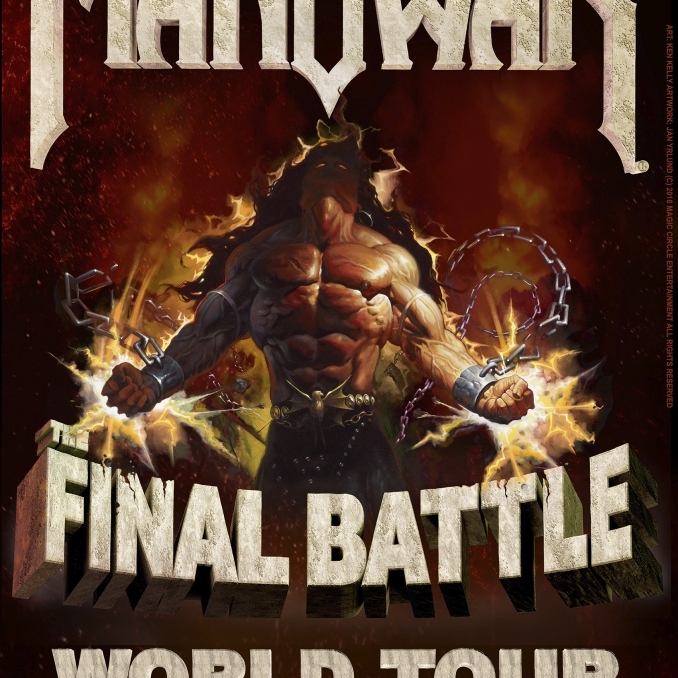 I think my expectations were hightened since this is Manowar’s final world tour (or so they say) – usually when a band is on their final tour, everything is amplified – the emotions, the show, the volume… But Manowar didn’t really give me that impression Monday night. It seemed less like a big band giving their final swansong, and more like just another ol’ day at work for them – which would be fine at a normal concert or a festival, but at a “final tour” concert (with “final tour” prices! ), it was unexpectedly disappointing. That’s not to say that they didn’t have any good songs. After a pretty abrupt beginning with the self titled “Manowar”, the audience got warmed up with the battle hymn “Call to Arms”. After that it was a bit up and down with a lot of songs kinda melting together, but there couple of highlights throughout. I really liked the ballad “Swords in the Wind” where you really got to see Manowar’s viking-philia, with torch-wielding vikings standing in the backdrop of the stage. In particular, “Fighting the World”, “The Power of Thy Sword” and “Warriors of the World United” were pretty solid performances as well. After an arguably incoherent speech by bassist Joey DeMaio, the band wrapped up the show with the classic “Hail and Kill” which was very well-received by the audience and was a decently satisfying ending. My main impression is that the actual performance was okay, but that the flow between the songs was very lacking. I felt like they were going from song to song without much/any foreplay, aside from a bit of crowd interaction here and there by singer Eric Adams – it felt a bit impersonal. Perhaps the experience was completely different in the pit (I was somewhere in the middle), or maybe if I had been a long-time Manowar fan I would have loved it. Maybe this is how all their shows are supposed to be? I don’t know. But in summary, I was disappointed that their big goodbye party was so generic. Not bad per se, but definitely generic.